"An interesting simulation game where you get to step in to the shoes of a moderator." 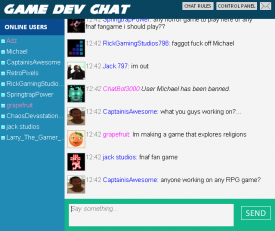 Chat Police is an unusual but kind of fun experience as you get to experience what it’s like to be a moderator in a chat room, this one being specifically based on the Gamejolt website although there is no real time chat room on the website but this is based on a fictional version. 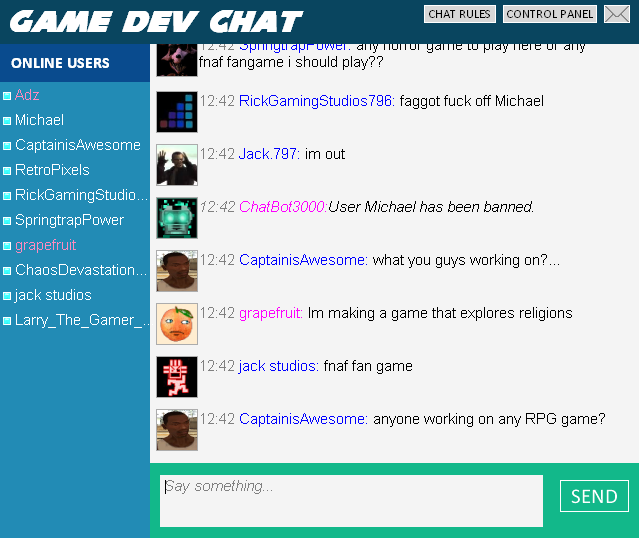 Once in the chatroom you are giving the powers of moderator and you must check the list of rules such as not allowing people to talk in all capital letters and stopping threatening behavior or foul language, you will have the choice whether to temporarily mute the users or ban them and kick them out of the chatroom. You can also send messages directed at the users telling them to calm down or to stop speaking in a certain manner and hopefully subside the antisocial behavior before it gets out of hand, you will also receive messages from other mods giving you advice if they feel you are not keeping the room under control however if you let things get too far out of hand or if you become involved in bad behavior also you may well find that you not only lose your moderator privileges but become banned from the room yourself and then it will be game over. Although a simple game with no musical accompaniment there is something strangely addictive and compelling about Chat Police, perhaps it’s something about wielding that power over the room but this game is a lot more enjoyable than it may seem at the surface. 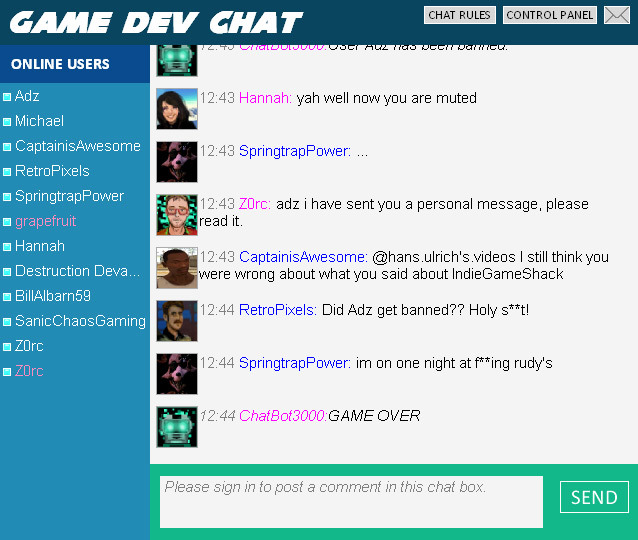 You can download Chat Police here for free.